Many property managers on Oahu are shifting to a zero tolerance policy towards smoking in the properties that they manage. While some investors may disagree with this restriction, if often times benefits them in the long run. 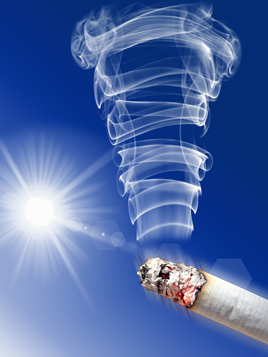 Smoking can be very destructive to a home regardless is its from cigarettes, cigars, marijuana, etc. The odor penetrates into drywall, carpet, the ventilation system and blinds. The longer and more often the tenant smokes, the worse the damage. No, this isn't Febreeze or Lysol. This type of odor requires something a bit stronger. A commercial grade deodorize may be able to eliminate mild smoke odors in a home which proves to be a very cost effective approach for landlords and property managers. Its best to use this when the property is vacant because in most cases, these products are not safe to inhale and are flammable. What they do is mask or cover up the odor, it doesn't actually remove it. For small jobs, a cover up may be all that’s needed. While prices vary considerably from place to place, cleaning the duct work and ventilation system may be all that’s needed to remove a smoke odor from a rental unit. This is usually a safe process that can be done with the tenant living in the property and it can save investors’ money if they are the ones paying for the service. They will generally clean the duct work using a variety of different tools depending on the type of material used in the property. In a lot of cases, they will even need to clean the interior coils of the heating and cooling system. For more severe odors, an enzyme treatment is needed which involves spraying enzymes into the ventilation system while its running. The system will usually need to be left on circulating air for a few days while the enzymes got to work. This breaks down smoke particles thus removing the odor at the source. This approach may be the best technique because it impacts the entire home and it involves cleaning the coils for the heating and cooling system which often times accumulates additional debris from smoke particles making the system work harder to heat or cool the home. This is a fairly scientific method to remove odors from a home which can be both cost effective and quick; two phrases that both landlords and property managers love to hear. The drawback is that it cannot be done effectively while at tenant is living in the property; although the tenant could be temporarily displaced during the treatment as it generally only lasts one to two days. Essentially, this breaks down smoke particles by changing its atomic structure by saturating the property with ozone. Strong and stubborn smoke odors may require a variety of different approaches. Before going to this next step, its recommended to attempt the ventilation cleaning and ozone treatment first as those are usually more cost effective and they would have to be done in this step if they were not done previously. The works consists of paint, blinds and carpet. Smoke odors will penetrate into all three, even if the blinds are made of plastic or metal because smoke particles will coat external surfaces if it cannot be absorbed. When painting, a special primer must be used to encapsulate the odor before apply the final coats of paint. Replacing carpet and carpet pad is a great way to eliminate one of the main sources of smoke odors. Blinds may be a final step if the odor persists, but it is often not needed if they can be cleaned thoroughly. Smoke odors can be a landlords nightmare because they can be difficult to remove. Its important for property managers to know the best techniques to remove smoke odors.